IN ITS relatively short existence since it was launched with fanfare as a Silicon Valley start-up in San Francisco, USA, in 2009, the Uber brand has managed to spread its reach right across the globe with relative ease. Over the past six years the revolutionary taxi operation has faced a string of public relations faux pas, rubbing a lot of people the wrong way and generating a mixed basket of admirers and opponents wherever it operates. Clearly, while much of the world has firmly integrated e-commerce, it did not seem to be ready for and was caught off-guard by a taxi operator that doesn’t own any of its vehicles and thrives on a new concept of ‘e-hailing’ to connect passengers to drivers. Existing taxi operators continue to see Uber as a threat to their businesses and in places like Paris, London, Johannesburg, Cape Town, Berlin and elsewhere have even resorted to violence in trying to prevent Uber drivers from operating without the necessary permits on the routes they consider to be theirs. 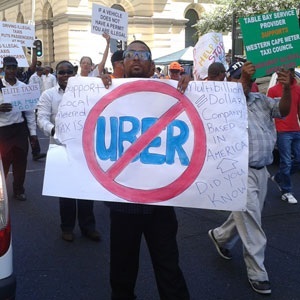 Seemingly taking a leaf from Small Business Development Minister Lindiwe Zulu, some South African taxi operators have demanded that Uber share the secrets of its application with them, to enable them to compete on the same level. Khulekani Magubane of Business Day wrote in January 2015 that Zulu – at the time responding to widespread xenophobic attacks on foreign business owners – stated that the latter could not expect to coexist peacefully with local business owners unless they share their trade secrets. – In trouble: France, where a government ban was set aside by a lower court and referred to a higher court. The operator is also in trouble in South Africa. Noting the number of Uber drivers who have been in trouble for harassing their passengers and other forms of misconduct in several cities across the globe, disgruntled passengers resorted to sharing their unhappiness on the dedicated Twitter handle ensuring that others get to know about their experiences. Uber has been accused by many brand specialists, including this writer, of having failed to clearly define and articulate its brand values. The nature of its operational structure – with drivers owning their own vehicles and not regarded as employees – means that Uber’s corporate reputation relies heavily on the conduct of the independent drivers who are, in actual fact, just partners. They do not necessarily share a set of values. Despite all of the above, nothing seems to be stopping the rapid growth of this ‘e-hailer’ taxi service. Increasing numbers of customers in South Africa, especially in the middle and upper classes, have voiced their satisfaction with the service, preferring it to traditional meter taxis. The latter are said to be unreasonably expensive and often dirty. Uber, on the other hand, is described as meeting its customer needs head-on. Many Uber drivers have also come out to relate personal stories of how their livelihood has improved since they partnered with the ‘e-hailer’ taxi service. Confident of its moral high ground in the ongoing debates and in an unprecedented move by a profit-making business, Uber has launched a social media campaign, an online petition, and a Twitter hashtag #CTNeedsUber to appeal directly to its customers for support. Western Cape Premier Helen Zille has since announced amendments to relevant provincial and City bylaws to enable Uber to operate alongside other forms of public transport. Partly responding to this campaign, she tweeted that “If city supports Uber_RSA’s applications, licences will be issued”. Other public personalities have since also come out to support Uber in Cape Town. The seeming success of Uber, a commercial brand, in appealing directly to the public for support in its battle for legislative accommodation is an interesting phenomenon, as it demonstrates what brands can achieve if they manage to tie their fortunes with those of their customers.